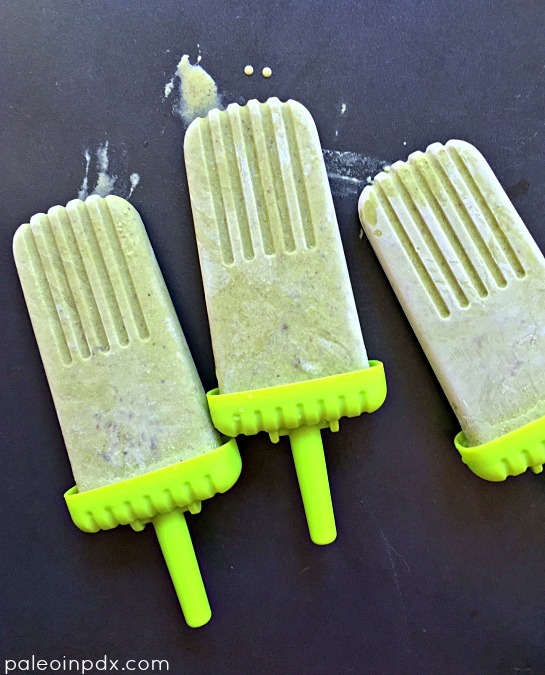 These chocolate mint popsicles are creamy and full of mint chip flavor. Not only that, but they’re dye-free, have no refined sugar, include a dose of protein and probiotics, and have vitamins and minerals from the spinach (and natural light green color to boot). They are not your average popsicle. They’re the perfect healthy treat on a hot day and I’ve definitely been enjoying my fair share. I went through two rounds of experimenting with this recipe, so I’ve had a freezer full. No complaints on my end! In the directions, you’ll notice that I don’t add the chocolate pieces to the blender. It doesn’t work all that well if you do and I know since I tested it this way on my first trial run. The chocolate pieces break up a bit more, but then sink to the bottom, which means you then have to scoop them out by hand. Meanwhile, I’ll be making these popsicles on KATU Afternoon Live at the end of the month, along with two other flavors (one of which will be for adults only). Stay tuned for those recipes! UPDATE: watch the replay of my KATU Afternoon Live segment HERE. To a high speed blender container, add all the ingredients, except the chocolate. Blend on high until smooth. Pour mixture into popsicle molds, leaving a little space at the top of each mold. Then, disperse chocolate evenly among the molds. Top off with more of the mixture and stir a little with popsicle stick, if desired (chocolate will distribute a bit during freezing though). Freeze for 6-7 hours or overnight. Once ready, rinse mold under hot water briefly to remove popsicle. Note: I used these molds, but the Dixie cup & popsicle stick method will do the trick as well. Just put the stick in halfway through freezing. This way, the sticks will stay centered.